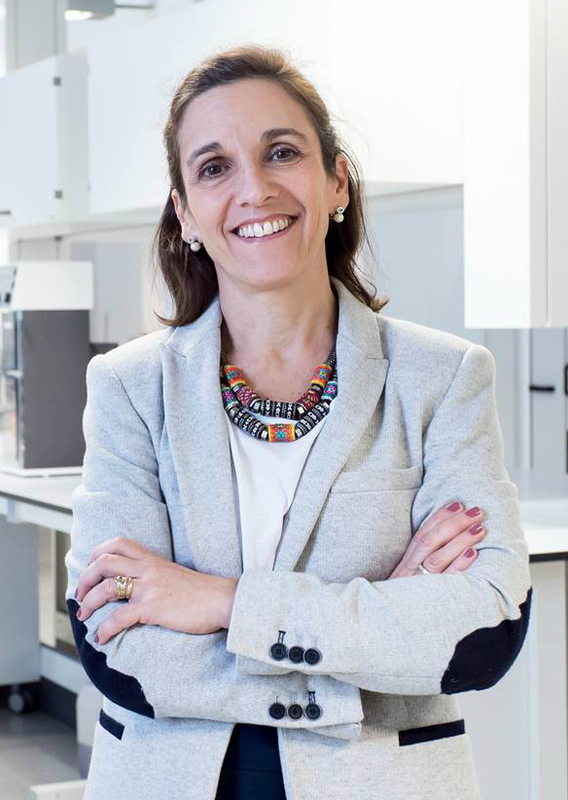 To sum up in a few words, the use of biomaterials for bone regeneration is the main concept around which Maria Pau Ginebra’s research work revolves. A Physics graduate from the Autonomous University of Barcelona (UAB), she developed an interest in knowledge application in the materials field, which led her to prepare her thesis with engineers from the UPC. After years of work, she is full professor in the UPC Department of Materials Science and Metallurgy (CMEM). Her research work, at the head of the Biomaterials Division of the Biomedical Engineering Research Centre (CREB), drove her five years ago to create a spin-off to apply accumulated knowledge. A few weeks ago, she was a finalist in the EU Prize for Women Innovators, and she has just registered her tenth patent. – My original training, in Fundamental Physics, is quite far from knowledge application, but I have always been attracted by the world of materials. That’s why I was driven to prepare my thesis at the UPC, with Professor Planell, who was leading a biomaterials research group. The connection between materials and health captivated me and has marked the development of my career. The success of your career can be seen in the recognition you have gained, including the Narcís Monturiol Medal in 2012 and the Racquel LeGeros Prize a year later. Of course, it can also be seen in your research work, reflected in over 150 papers in high-impact international journals, and in ten patents. – The aspect of the UPC that attracted my attention was that, in the 1990s, it was one of the few universities that already had a patents department and a defined programme for transferring knowledge to products. My doctoral thesis led me to register my first patent, and this opportunity to apply knowledge captivated me. Over the years, I have been able to combine writing papers with the development and registration of patents. University lecturers are in a rather contradictory position, as we are evaluated through our scientific publications, which are difficult to coordinate with other tasks. It is also difficult to achieve a balance between science and family life. The percentage of women in research careers undergoes the “scissor effect”. In other words, women are in the majority at bachelors’ degree and postgraduate level, but the proportions are reversed in the next stages, and the percentage of women as directors of research groups and/or research centres is extremely low. – Women need more measures to achieve a balance between research activity and family life. Women who have children are not under the same conditions as men. Job quotas can be established, but I don’t think they’re the best idea, they seem more like consolation prizes. I prefer measures such as increasing the flexibility of working hours and allowing women who return to work to focus on research and freeing them temporarily from teaching commitments, which is what happens at the UPC. Perhaps actions are also required to increase visibility by presenting role models: cases of women who are successful in their research careers, even though they started at a disadvantage. Another related problem that affects for both women and men are the low numbers choosing careers in Sciences, Technology, Engineering, and Mathematics (STEM). – This is partly due to the culture of effort. Sometimes young people are not willing to take studies that are difficult. We need to make these qualifications attractive, by presenting role models that are far from the geeky stereotype that is normally associated with these students. This is a priority that largely affects girls, but also boys. One of the Achille’s heels of the science and technology system is the management of projects and grants, the bureaucracy. Is the problem serious? – It’s terrible. You realise when you travel around Europe and see how management works in other countries. I’ve often asked myself if it is worth it, because sometimes I get the impression that I spend the whole day on management and have no time for research. There’s a lot of paperwork involved in calls for applications, and we have few people to support us in this kind of tasks. Where is this issue resolved best? – Countries in the north are exemplary. Holland, for example, where they are very pragmatic: they’ve managed to reduce the management burden and have specialised human resources. And in Ireland, where a lot has been invested, but in return considerable resources have been obtained through calls such as those of the ERC. They have very well-trained people at technical level to assist with scientific proposals. Technology centres are recovering from the recession. Have they improved in terms of their relations with the production sector? – We’ve been through some very difficult years, and we still lack a culture of innovation, but a change can be seen in companies. I think the role of industrial doctoral degrees is very positive in this respect. They are the seed that enables us to create a link between university and company. They pave the way for industries to employ PhD holders. In our group, we have two people taking these programmes. They are the right instrument for forging links between the production sector and university research. Your participation in the EU Prize for Women Innovators, in which you were a finalist, has enabled you to evaluate the work carried out by Mimetis. The company came out of your research, is dedicated to the design of personalised bone implants, and already has a product on the market. – It was a very interesting experience. It gave me the opportunity to meet other women in the same situation as me in other parts of Europe. However, it was also useful to undergo the evaluation for the prize, which was organised into four areas: originality of the project, economic impact, social impact, and leadership of the woman at the head of the initiative. It was a good self-analysis exercise with interesting results. The creation of your company, a spin-off that arose from research projects developed at the UPC, represents a landmark in your career and completes the knowledge transfer process. – We launched Mimetis in October 2013. We were two lecturers and two doctoral students. We were motivated by the fact that we had been working for over 15 years on a specific type of material that had resulted in several patents, some of which were licensed to others for their use. We were the right people at the right time, and we started out. In five years, we have grown, with eight employees, a turnover of 200,000 euros in 2016 and a product on the market: MimetikOss, the first biomimetic synthetic bone graft. Activity in the health sector is subject to regulations that make it special and that determine much of the work in the first stages of development of products and services. – When you start out you are very naïve. Meeting the regulations is very expensive in terms of time and money and is the first barrier that must be crossed. In 2016, we launched the first product on the market, and this was the first major milestone achieved. Now we face another challenge: to create personalised grafts for each patient, using 3D printing technology. In July, you set up a funding round via Crowdfunding. – It’s a bridge funding round designed to raise 120,000 euros. We’ve just started, so I don’t know how it’s going yet, but we’re optimistic. What are you doing now? What are the next challenges in your research activity? – We’re working on the design of personalised bone implants for each patient. The aim is to make them to measure and quickly, by means of a technology that uses a material that’s very similar to the patient’s bone to help their integration. And the key is the internal structure of the implants. Determining the best structure in each case is what we are researching right now. If it works out well, the opportunities are enormous. One of our challenges is to print 3D prostheses inside the operating theatre. We are working with materials that will harden at room temperature, so that the implant can be made on the spot in the operating theatre, during operations. This will be revolutionary. This entry was posted in Sin categoría on 4 October, 2018 by www-citupc.